Windows 10 Pro for Workstation PCs – A new edition of Windows! Microsoft recently announced Windows 10 Pro for Workstation PCs, a new edition of Windows, with support for specific features listed below. Windows 10 Pro for Workstation PCs will begin shipping on Dell Precision systems with Intel Xeon processors on October 3, 2017. 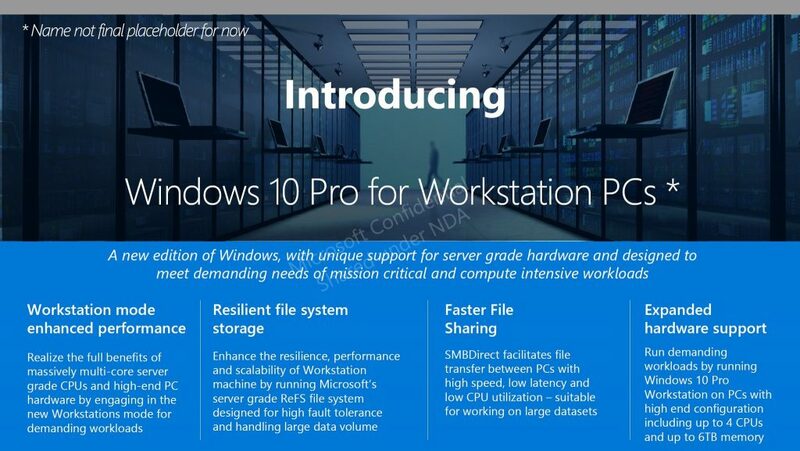 For customers using Intel Core i3/5/7 CPUs, workstation systems will be deployed with Windows Professional. For customers using Intel Xeon CPUs, workstations systems will be deployed with different Windows Professional for Workstation PC SKUs based on the specific selected CPU. Precision Xeon orders placed before October 3, 2017 will ship with standard Windows 10 Pro and may be upgraded by purchasing the Workstation edition through the Microsoft Store. Precision system orders with Xeon processors placed on or after October 3, 2017 must include the new edition. We are committed to working with you in developing any and all options based on this mandatory licensing change. The initial capabilities listed above will become available approximately in December when Microsoft launches Fall Creators Update, the newest version of Windows. We will help you with your Windows 10 options and strategy. If you have any questions, please feel free to contact us.